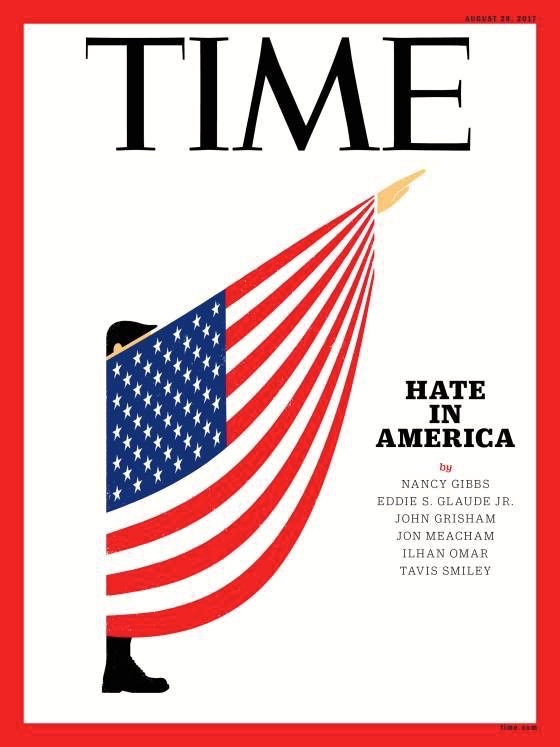 … in response to neo-Nazi and white supremacist demonstrations in Charlottesville VA. Yesterday’s posting “Two cartoonists take on Charlottesville” had a striking Jon Berkeley cover for the Economist. 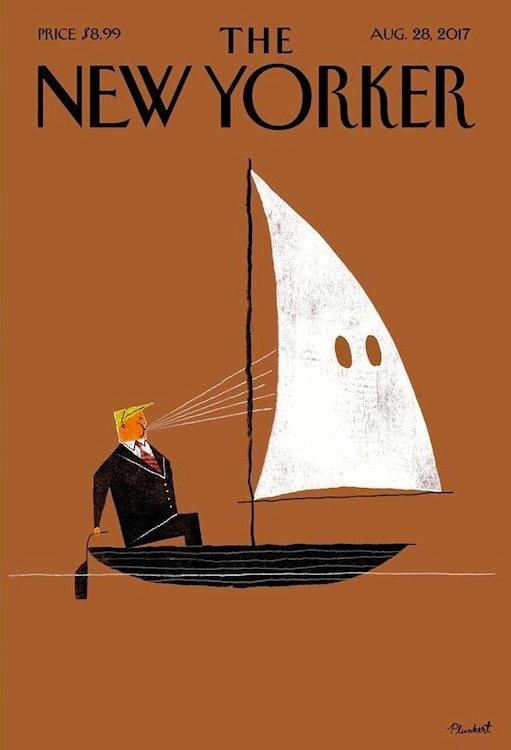 Now: a David Plunkert cover “Blowhard” for the New Yorker (alluding, like Berkeley’s cover, to a KKK hood) and an Edel Rodriguez cover for Time (alluding to the Nazi salute). David Plunkert is an American illustrator and graphic designer based in Baltimore, Maryland. 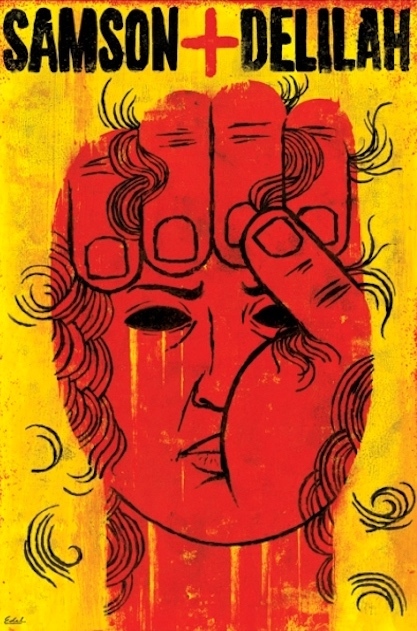 He is best known for his editorial illustrations and theater posters. 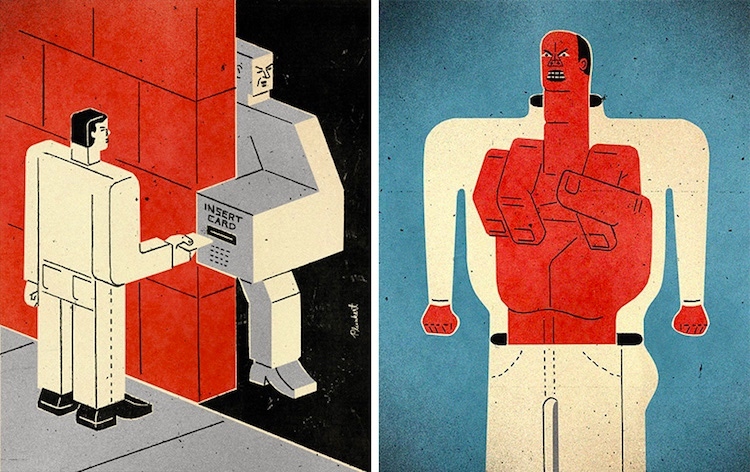 His illustrations are highly conceptual, in two styles, Dada influenced collage and spare blocky graphics. DB: please could you tell us briefly about your background? DP: I originally wanted to be a cartoonist but ended up studying design at shepherd college (now shepherd university) in west virginia. there wasn’t an illustration program there but the design program stressed conceptual problem solving using illustration combined with typography. after I graduated I worked as a graphic designer at a now defunct baltimore design firm for about five years before I started freelancing as a graphic designer and illustrator. around 1995 my wife joyce hesselberth and I started spur design and that’s where I’ve been ever since. we purchased and renovated a 10,000 square foot warehouse in baltimore that is now our studio and gallery space. Edel Rodriguez (born August 22, 1971 in Havana, Cuba) is a Cuban American artist. He is a Cuban born American illustrator/artist and children’s book author. He uses a variety of materials, his work ranges from conceptual to portraiture and landscape. Socialist propaganda and western advertising, island culture and contemporary city life are all aspects of his life that inform his work. 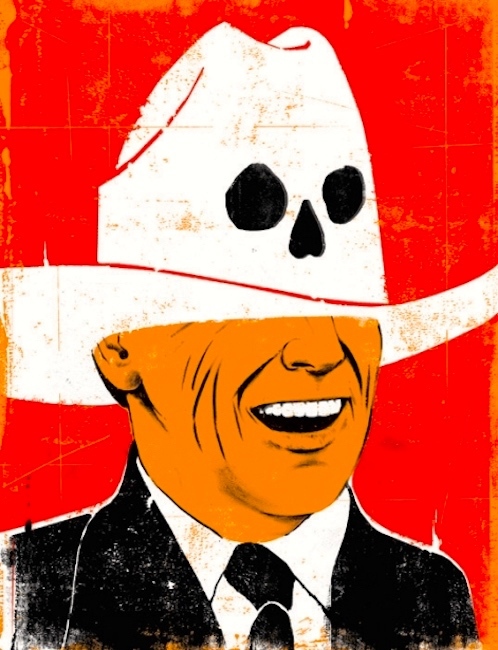 Included here because the cowboy hat seems to allude to a KKK hood (or a Mexican Day of the Dead mask, or both). The image is in his portfolio on Allpick, but without any explanation. My guess about the subject is that it’s George W. Bush, but I’m not at all sure of that. This entry was posted on August 18, 2017 at 8:42 am and is filed under Art, Language and politics, Linguistics in the comics. You can follow any responses to this entry through the RSS 2.0 feed. You can leave a response, or trackback from your own site. What’s really cool about the New Yorker cover is the two different ways that the effort to move the boat is futile.